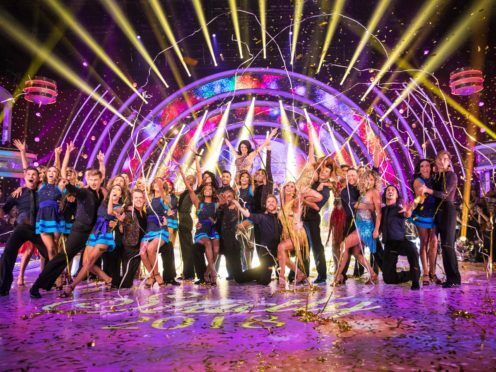 Strictly Come Dancing triumphed over The X Factor on Saturday night as it launched to 8.1 million viewers, according to overnight ratings. The opening episode of the programme’s 16th series attracted an average audience of 8.1 million (40.9% share) and peaked at 8.5 million viewers, making it the most watched show of the day across all channels. It marks a dip on last year’s launch when it drew an average of 8.8 million viewers and peaked at 9.5 million viewers. Viewers saw the celebrity contestants learn who their professional dancer partners will be during the BBC’s flagship entertainment series. Fashion guru and TV presenter Susannah Constantine was partnered with Anton Du Beke on the launch show which featured music performances from Nile Rodgers and Chic, singer Craig David and rapper Stefflon Don. Saturday’s episode of The X Factor drew an average of 4.6 million viewers (24% share), including those watching on the ITV HD and ITV+1 channels. The show peaked with 5.6 million viewers last night and was the most watched show of the evening for 16 to 34-year-olds, with a 39% share of the viewing for the age category. Last week 5.7 million viewers tuned in to watch the debut of the singing competition’s new-look judging panel of Robbie and Ayda Williams, Louis Tomlinson and Simon Cowell, with a peak of 6.3 million. Strictly Come Dancing and The X Factor did not directly compete against each other on Saturday, with Strictly starting at 7.35pm and The X Factor beginning at 8.30pm, but there was a 30-minute period of overlap. The figures for both shows are likely to rise when the official consolidated ratings are published. These will include viewers who recorded the shows and watched them up to seven days afterwards on catch-up. The figures do not take into account the number of views clips from The X Factor receive via online video platform YouTube.